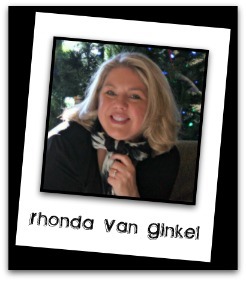 Blog Quick Quotes: Introducing... Rhonda Van Ginkel! Hi, I am Rhonda Van Ginkel! Greetings to you from the “not so frozen” tundra in Minnesota! I reside in the Twin Cities area with my dear husband, and our 2 sweet boys, ages 4 and 3. You’ll find them in much of my scrapbooking adventures and as silly as they are, they offer some fine material to work with. Ha! I’m one very lucky lady!!! Rounding out the family circus are our two little dogs. The discovery of scrapbooking for me was after the birth of our youngest. A friend invited me to a crop to get out and said “Just bring your photos, you can organize those and we can visit.” Perfect, right? That night I got all my pictures sorted and what a great accomplishment! After, I looked around and took notice of what they were doing. In that moment I knew I wanted this for my children. I really wanted for them to have a book of their own that told their story in my own words and with my loving touch. My work has been published in Scrapbooks Etc., Cricut Magazine, Cricut Families Idea Book, Scrapbooking News and Review and several online galleries. I am so honored to represent Quick Quotes as their Social Media Director. Quick Quotes products are top quality and they make journaling easy with their beautiful and heartwarming vellum quotes! My favorite products are the Quotes, PowderPuff Chalk Inks, Frosted embellishments and our new Chipboard Laser Diecuts!!! Please welcome Rhonda back to the Quick Quotes Team! Stay tuned to this blog for some beautiful inspiration starting tomorrow!!! Rhonda... I love your work and I'm looking forward to working with you on this team! YAY!!! Rhonda! I am so glad to be working with you this year!!! Congrats on joining the team! Looking forward to seeing your projects over the coming months! And social media director to boot- lucky you! Glad to see you stuck around for another term, Rhonda! I'm always inspired by your work. Wonderful. Isn't the Mall of America in Minnesota? I've been to it twice when it had a Snoopy theme and enjoyed it.